A Seat At The Table, is the critically acclaimed #1 selling album from Solange Knowles. This exclusive red color anniversary edition of the album will be pressed on heavyweight 150-gram vinyl with each package individually numbered and available for a limited time only. A Seat At The Table was initially released on September 30th, 2016. 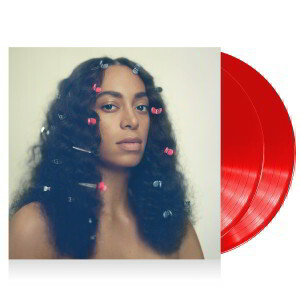 Solange describes A Seat At The Table as “a project on identity, empowerment, independence, grief and healing.” A Seat At The Table was written by Solange, and features a host of guest artists including Q-Tip, Kelly Rowland, The Dream, BJ The Chicago Kid, Kelela, Tweet, Moses Sumney, Sampha, Sean Nicholas Savage, Nia Andrews, Devonte Hynes of Houston Texas and Lu of Carolina. Solange has been such an incredible inspiration to me since Solo Star but I didn't really connect to Solange until her sophomore album, Sol-Angel &amp; The Hadley Street Dreams in 2008. Maybe I was too young to understand her during Solo Star but once I held Hadley, I admired her music since. This album, A Seat at the Table, answered a lot of personal thoughts that many black people have had to talk about in the privacy of their own homes. A Seat at the Table taught me about standing up for my blackness and not letting the world think because of my heritage that I am weak nut stronger than ever. THANK YOU SOLANGE FOR HONORING US!!! A Seat at the Table . 2015-2016 was terrible for me. I had experienced two deaths of women I admired in my life. My closest friend to breast cancer and then my grandmother who raised me. I was lost. There were no words for what I was experiencing trying to hold a job down while sleep walking through life. Hearing A Seat At The Table. Put every emotion I have ever felt as a black woman into words. I listened to this cd every morning and night for 1 year, that was until I put it in the atmosphere to meet Solange. The heaviness of living in Austin, TX and the constant changes seeing cranes up everywhere to being MAD as hell that I no longer have the two women who helped me be the woman I am today. Then there is FUBU, awww as a black woman in tech I dealt with so much resistance towards my existence in those spaces which have very few people who look like me. This one single thing was for me. Borderline. Thank you for the healing cd that I needed, I can not wait to hear what else you have to say dear sisterfriend. I am Admin. for FB Group: "Friends Who Like Solange", 400+ Members. I also am Admin. for FB Page: "Soul Angeles", a photo gallery of Solange Fans. I was a Stan since Destiny's Child, fave of my 3 God-Daughters my friend adopted after crack o.d. of mom. School kids bullied these girls at 3-to-7 years old. Over the years the affirmative lyrics of Solange and bouncy fun of Beyonce became aspirational. They learned the songs and dance routines, earning nrw, respectful friends. One became a Manager with UPS. One graduatef from College. The third married a nice young man. I love DC, Beyonce, but: Saturday Night Live left me "Solanged". I need healing after listening to Solange. She always killing me softly with her sound. Props! I´m in love with this album, magic. Pure artistry, from your movements, lyricism, the sonics, the photography; I'm constantly taken on a journey. I'm transitioning from and leaving the early 20s; this has been a hard process sometimes all I do is sleep and listen and hate myself for not doing enough. "A seat at the table" provides a calm for me in all chaos that's in my head. Every time I see your images and how they're always artistically portrayed it always commands a pause and sometimes that's all I need. been up 24 hours studying for my final exam cause I decided to not pay attention for 3 months (well my professor didn't garner my attention) and all I can listen to is Rise .. "fall in your ways .. so you can crumble .. fall in your ways so you can sleep at night.. fall in you ways so you can wake up and RISE"